Unimportant, but bag should be worked loosely. ROUND 1: 30 sc in fender washer, slip stitch to join, ch 1 do not turn. This is the right side. Single crochets should be very crowded, this is so that when it is felted it will completely cover the fender washer. ROUND 2: Join main color in any sc with a sc. Sc in 4 sc, 2 sc in next sc, repeat around. Join with slipstitch in first sc. Ch 3 do not turn. ROW 1: Dc in 1 sc, hdc in 3 sc, sc in 3 sc, hdc in 3 sc, dc in 2 sc. Ch 2, turn. ROW 2-10: Dc in each st. Ch 2, turn. JOIN STRIPS: Holding two strips with wrong sides together, sc in 25 sts. Leaving the rounded end unworked. Repeat with third strip. Fasten off leaving at least 12” tail for sewing flap to bag. Lay bag flat and center flap on one side. Sew flap to bag. Repeat on other side. Sew strap ends together. I blocked my bag on a book that is 8.5 wide by 1.25 thick. This is a gorgeous bag!! Thank you for sharing yet another awesome pattern with us! I looked at all the bags you listed at "CrochetBags" and find you to be inspirational.. 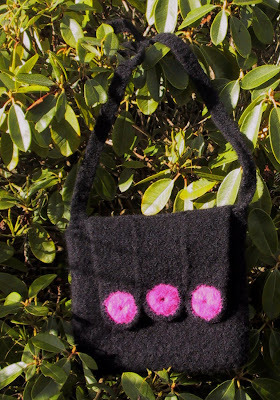 I just felted my first knitted bag last week and love the process. Can't wait to Crochet one, using your pattern, if you don't mind. Thank you for sharing! I just loved them all!